I WENT TO Macomb yesterday to write about the Macomb-Western Holiday basketball tournament for The Whig. It was a lot of fun and I appreciated the hospitality at WIU's Western Hall. I hung out with Emily before and after the games. 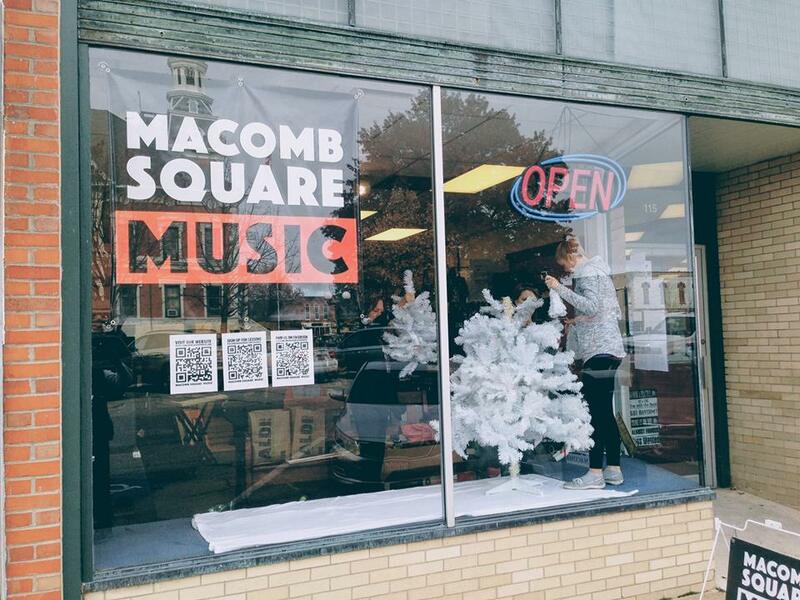 She lives on the square and around the corner from Macomb Square Music, so of course we had to pay a visit. 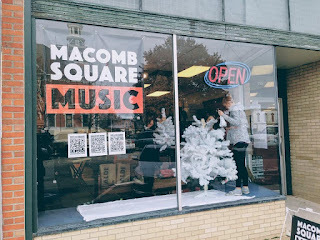 The owner, Adam Oliver, is a pleasant guy and we had an interesting chat about music retail and the trials and tribulations of owning a music store. It's always good to see how different small music stores approach the business. Adam tends to take in more consignment items and he buys instruments. It's an easier way to build inventory, and we did the same thing in our first months of Second String Music. I'll never forget Steve Rees coming into the Eighth and Washington store and saying, "I have some odds and ends, do you want to sell them for me?" We quadrupled our inventory on the spot and had some really cool instruments, and it went a long way to getting us up and running as a business. Adam's father comes in during the day to help out, and he has several customers who like to tinker and tune guitars, etc. Emily bought a nice ukulele book and we both promised to come back. I wish Adam the best of luck in the wild ride called music retail - have fun!